Jay Bouwmeester inked a new deal worth $3.25 million for next season. 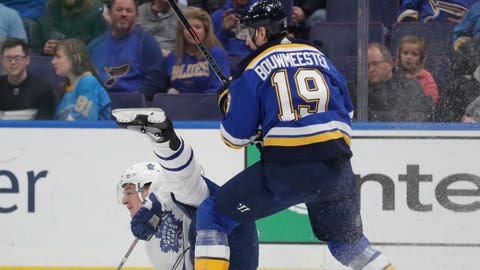 ST. LOUIS – Jay Bouwmeester, who enjoyed a resurgence along with the St. Louis Blues in the second half of the season, will be a Blue for at least another year. The Blues announced Monday that they have signed the 35-year-old defenseman to a one-year contract extension worth $3.25 million. Bouwmeester had 17 points (three goals, 14 assists) and 40 penalty minutes in 78 regular-season games this season. He has 415 points (87 goals, 328 assists) and 615 penalty minutes in 1,184 career regular-season games spanning 16 NHL seasons with the Blues, Panthers and Flames. The Blues acquired Bouwmeester from Calgary on April 1, 2013. He has played in 434 regular-season games (10th in franchise history among defensemen) and tallied 115 points (16 goals, 99 assists), which ranks 15th. He also has a +42 rating, ranking ninth.